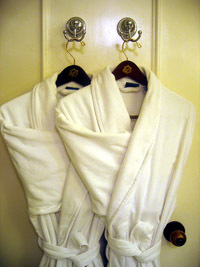 With 72 hours notice these lovely enhancements can be in your room on arrival or delivered during your stay. If you don’t see what you’re looking for, call and we’ll make every effort to accommodate your request. 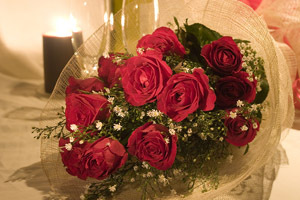 A dozen roses are sure to draw your loved one right into your arms. We are happy to include your personal romantic note. Prices may vary during holidays. The height of luxury and sensual relaxation. A full body massage by a certified massage therapist, in the privacy of your room. Not available in the Dorsey. The Carriage House will arrange for a splendid bouquet of flowers that say, “I love you” or "I didn’t forget.” We’ll gladly include a personal note from you and have them in your room upon arrival. The Carriage House is the perfect spot for your next business meeting, church retreat, family gathering, or getaway with friends. Book the entire house, all twelve rooms, for only $1,775 plus tax, per night. Available Sunday through Thursday nights, November through May. The price includes breakfast and afternoon snacks. We will gladly serve lunch or dinner upon request. Please call 269-639-2161 for all the details.